The pie Khi has chosen for this week is Lemon Meringue. Though a favorite of our family, Lemon Meringue is quite a challenge for a second time pie chef! With very little adjusting, the recipe we're using comes from WikiBooks Cookbook. 1. In a saucepan whisk together water, sugar, flour, cornstarch, salt, lemon juice. Make sure any flour or cornstarch lumps are stirred until they dissolve. 2. Cook over medium heat until mixture starts to simmer. Stir constantly. 3. Add butter, stir until melted. 4. Beat egg yolks in a small bowl. Add about ½ cup of hot lemon mixture into eggs and stir well. This tempers the egg yolks so they won't scramble when added to the simmering lemon mixture. 5. Pour tempered egg mixture into pan of simmering lemon mixture. Stir until well mixed. 6. Continue simmering lemon filling about 2 minutes until it thickens, stirring constantly. 7. Pour into cooked pie shell and allow to cool while preparing meringue. 1. Place 4 egg whites in mixer and beat at high speed until they start to foam. 2. Add cream of tartar to egg whites then, while continuing to beat, add sugar, 1 tablespoon at a time. Beat about 30 seconds between tablespoonfuls of sugar. 3. Continue to beat meringue until stiff peaks form when beaters are raised from bowl. 4. 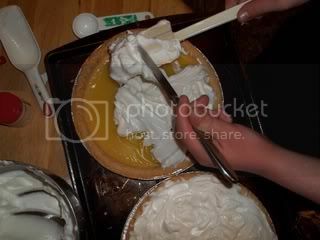 Spread meringue over pie, starting on lemon pie filling, using rubber spatula. 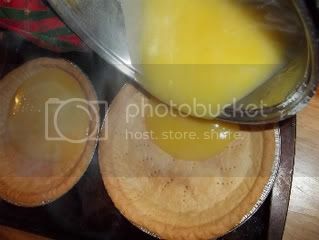 Spread over edges of crust, completely sealing in the lemon pie filling. 5. To form peaks in meringue, using a rubber spatula, touch flat side of spatula on meringue and pull away. Repeat over entire surface of meringue. 6. 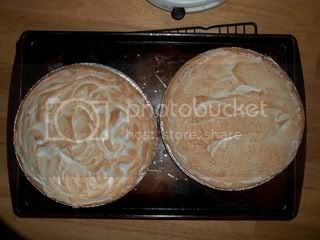 Place pie in 350°F oven for 15 minutes until high points of meringue are lightly browned. 7. Serve at room temperature or chilled. In the interest of maintaining some sort of Maternal sanity, I decided we would use bottled lemon juice and ready made pie shells. We'll save pie crust lessons for another week! Khi ~ If these pies tasted even half as good as they looked....I'm sure they were DELICIOUS! Great job!!!! !